Home > SERVING PIECES > Serving Platters 11"
Home > PLATES & PLATTERS > Serving Platters 11"
Polish pottery serving platters make a magnificent presentation for serving a complete dinner. 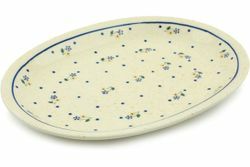 This stoneware oval platter is one of those timeless pieces you'll want around for both everyday use and entertaining. The hand-painted patterns create an intriguing variation in design within each piece. Strength, durability and beauty in each piece makes polish pottery dinnerware a beautiful presentation and a very practical gift.